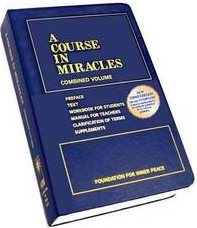 I don’t know when I first heard of A Course in Miracles. I do know that I purchased the book in March 2009 because I wrote the date inside the cover. When I tried to read it, however, I simply could not understand it. The style of writing was perplexing. The ideas it contained baffled me. I had never before encountered such teachings. I wasn’t ready for it and quickly set it aside. Then one day, a dear friend suggested that we form a study group to work on the Course. I believe he was just as bewildered by it as I was. But his suggestion was wise. He knew we could do together what we had not been able to do alone. So a handful of us met for the first time in July 2009. At that meeting, we tried to read a few pages of the Text -- which forms the Course along with the Workbook for Students and the Manual for Teachers. What we read in that first meeting made little sense to us. It left us frustrated. Somehow -- and I don’t remember how -- we decided to turn instead to the Workbook for Students, with its 365 daily lessons. We must have been divinely inspired in this decision, because it worked for us and has continued to work ever since. Now, more than two years later, we are well into the Workbook for a second time. The daily lessons and even the Text now make perfect sense. I now look forward to doing the lessons each morning after getting my first cup of coffee. I look forward to taking the teachings contained in the lessons into meditation where I can discuss them with my spirit guides. I look forward to the weekly study group meetings where we review and discuss the lessons that we worked on individually throughout the week. ACIM has totally changed my perception of the world, and I have become devoted to it. The study group meetings normally leave me in a state of bliss, because ACIM is helping me remember all the things I knew when still in spirit but forgot when I drew the veil of forgetfulness over me and incarnated into this physical world. Here’s one example of how the Course has changed my perception of the world: I used to believe that this physical world is real and that it was created by God, nature, and other forces external to me. I now know that I have been tricked by my five senses into believing this world is real. I now know that it was I who created the kind of world I see around me and all of my experiences in it. What I see “out there” is really just a projection of what is going on in my own mind. This physical world is an illusion, a hologram in which I can play and learn. None of it is real -- I made it all up! Thus, I am responsible for the kind of world I see around me and all my experiences in it. I am not a victim of life’s circumstances after all. Other people are not abusing me. God is not punishing me. I see what I see, I experience what I experience, and I feel what I feel because I choose to do so in my own mind. There is no point in going “out there” to change what you see in the world. You cannot control, manipulate, or fix it. This would be like going to a movie theater and stomping up to tear down the screen because you don’t like the movie you’re watching. The only way to change what you see on the screen is to find the projector in the back of the theater and change the film. The way to change what you see “out there” in the world is to change what’s “in here” in your own mind. Change your beliefs. Stop judging and condemning. Begin to practice unconditional love and acceptance. When you do that, the world you see “out there” will begin to change. You no longer will be trapped in unhappiness, pain, and suffering. ACIM is quite simple and unequivocal about this: You can remain asleep in this physical illusion, dreaming that it is real, for as long as you like. Or you can awaken spiritually and discover that you have been asleep in Heaven all along. Jesus Himself said that Heaven is here now, all around us, but we have not been able to see it. As we awaken from the dream of this physical illusion, we will be able to experience Heaven right here on Earth. As always, the ego doesn’t want you to know any of this. It wants you to continue to believe that this physical world is real. It wants you to continue to believe that your physical body is what you are. The ego knows that it will be out of business if you discover the truth. A Course in Miracles is one among many spiritual teachings, but for me, it provides a map out of this illusion. You can remain trapped in the illusion. Or you can remember what you really are: a divine spiritual being who came into this physical illusion to evolve and eventually find your way back out of it. Great stuff, Roy. I completely agree with your thoughts here and need to read this again and again. Then why do 7 billion people see the same things? Such as WWII or the current American President or the oceans, etc... If we separated ourselves in this hallucination, why does every human share and feel the same things? Because separation is the illusion.